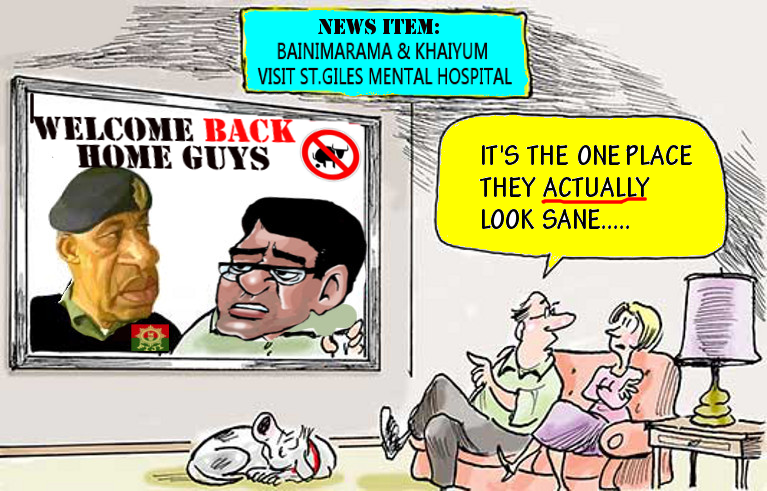 FijiVillage reported that the Ministry of Health and St Giles Hospital are working together to provide specialized mental health treatment at divisional health centres across the country. St Giles Hospital is currently the only mental health hospital in the country, so the aim is to open up more mental health units around the country. This is a fantastic service, if they can afford and sustain it. BUT this service first needs to focus on treating Bainimarama and Khaiyum who are holding Fiji hostage and stealing millions from the people. The other group that needs this service are the senior military officers who dress-up each day in their pretty uniforms but are too afraid to do their sworn duty and protect Fiji from treasonous and murdering criminals. When the leadership of a country is mentally sound then the country has a far better chance of success - abiding by the rule of law, holding truly free and fair elections, having a truly independent judiciary, a free media to inform the people on issues facing the country. This all helps to build confidence in the country and attract investments that provides more jobs, which stimulates the process by which goods and services are produced, sold, and bought. So it is in a country's best interests to keep the lunatics out of government and in a safe place where they can do no harm - in a mental hospital/asylum!